July 14-16 & August 11-13 at Yoga Heights in Washington D.C. Welcome to PYC’s Prenatal Yoga Teacher Training. This is an in depth, comprehensive 85 hour, Yoga Alliance Certified training is for those who want to confidently and responsibly dive into the world of conscious birthing and prenatal yoga and work with this very special population. 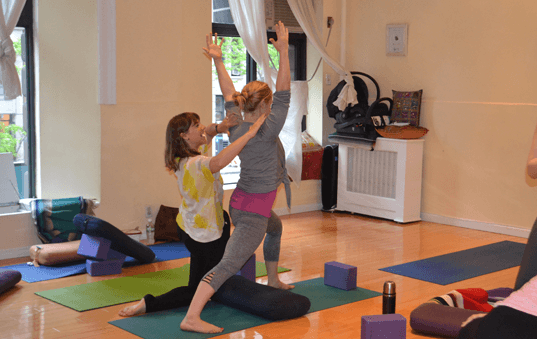 At Prenatal Yoga Center, we have developed a system of teaching using our unique three pronged approach to prenatal yoga. We are excited to share our philosophy and teaching with you. Highly trained and educated instructors cater to the anatomical, hormonal, and muscular changes which occur normally in the pregnant body by creating sequences which lessen discomfort so students feel better after each class. Classes also prepare the mother both physically – specifically with focus on proper pelvic alignment – and mentally for birth whether that be medicated, natural or cesarean. 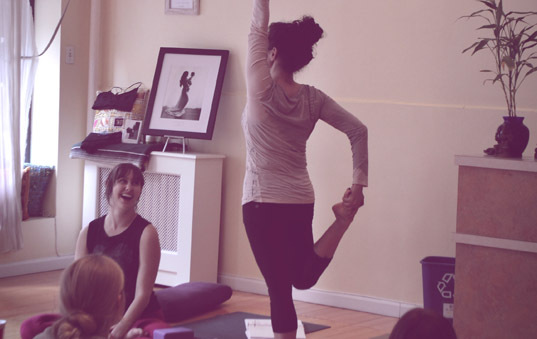 Our teacher training will teach the trainee how to confidently integrate these three components of our thought-out and established approach to prenatal yoga into a well rounded class. We believe that modifying asana for pregnancy is just the tip of the iceberg for a prenatal yoga teacher training. It is important to speak the same “language” as the expecting mother and through evidence-based research be able to guide her properly while supporting her in this transitional point in her life. We strongly feel it is the role of the teacher to help create a warm community for the mothers that extend beyond pregnancy, and through the often bumpy road of new motherhood, to a place of vitality, strength and confidence as the role of mother is achieved. Over the next 3 months you will have have access to our four online modules which contain videos with Deb and Caprice intricately teaching you the material as well as four hour long prenatal yoga classes. You will also receive our full teaching manual which will correspond with the videos. Through this training we will be in touch by Google Chat, as well as enjoy two long weekends together! Take a sneak peak at some of the videos from the membership website! You will start to explore the in depth changes to the anatomy and physiology of the pregnant body. We place particular focus on the abdominal changes and pelvic floor changes and how that can affect pregnancy and postpartum. This module also includes the episode “Your Pelvic Floor “ from the Yoga | Birth | Babies podcast. During this module you will start to see which asanas and pranayamas to encourage and discourage and modifications of the different trimesters. These pose will become your building blocks for structuring your prenatal yoga class. There is a strong focus on stabilizing the pelvis and asanas that encouraging optimal fetal position to aid in the birth process. You will also be introduced to the Prenatal Yoga Center teaching template. 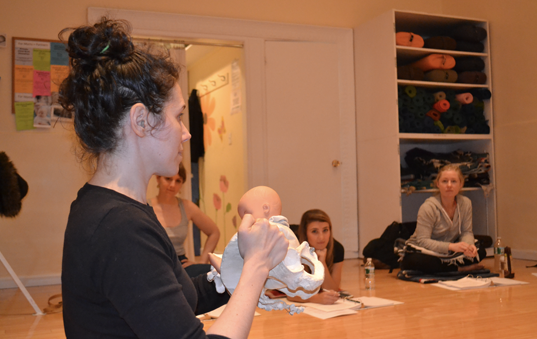 This module also includes 4 one hour prenatal yoga classes to take or just watch. This module also includes the episode, “Yoga in Your First Trimester” with Deb Flashenberg, “Aligning Your Body and Your Baby For Your Best Birth” with Dr. Randi Jaffee, “Spinning Babies, Gail Tully and the Importance of Fetal Position” and “Is Your Exercise and Yoga Routine Helping or Hindering Your Birth” with Deb Flashenberg from the podcast Yoga | Birth | Babies. In this module we shift our focus to Labor, Delivery and Interventions. We will explore the different stages of labor including the emotional signposts of labor, pain management and coping skills as well as common interventions and complications. We will also review therapeutic applications, assuring new teachers the information to help students with asanas and alternative modalities to common pregnancy aches and pain. This module also includes the episode “Empowered Hospital Birth with Terry Richmond “, “Undisturbed Birth with Dr. Sarah Buckley”, “Pain to Pleasure with Deborah Pascalli-Bonero”, “History of Birth with Tina Cassidy”, Doula Do’s and Don’ts with Deb Flashenberg”, “Pain, Suffering and Trauma in Birth with Penny Simkin”, “Labor Induction with Gene Declerqc” and “An Open and Honest Talk with Dr. George Mussali, OB” from the Yoga | Birth | Babies podcast. Your students have now had their babies and are heading back for Postnatal Yoga or Mommy and Me. We will breakdown the essential “6 areas for the postnatal mom” as well as cover general guidelines for helping support the postpartum mother and community. This module also includes the episode “4th Trimester Bodies Project “ and “Postpartum Depression with Dr Michelle Canarick” from the Yoga | Birth | Babies podcast. There are lots of moving parts to this Prenatal Yoga Teacher Training. To help you keep track of everything, we made a “Check List”. We advise that you use this as a guideline to make sure you have everything in order. And at any point, please feel free to email Deb or Caprice if you have any questions that need attention before or between the long weekend intensives. Don’t forget to schedule your welcome call with Deb! You can do so on…. This 10 minute call is intended for you to connect with Deb and ask any initial questions you may have. Please be respectful of the time and if you need to reschedule, Deb asks that you give her at least 24 hours notice. The indepth Prenatal Yoga Center teaching manual. Out of state teachers will be required to observe or take at least 4 prenatal yoga classes in their community. In depth book list which will be the basis for discussion over our long weekends together. 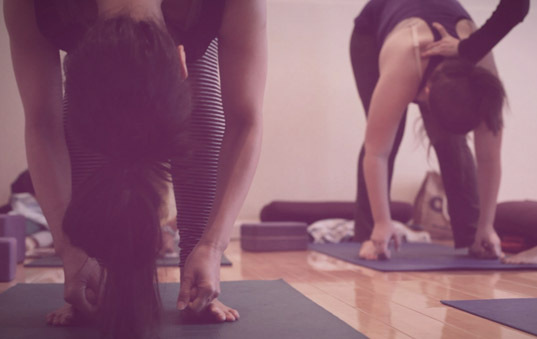 Applicants MUST already have completed a 200 hour Yoga Alliance Yoga Teacher Training. Teacher Trainees are expected to already have obtained the knowledge of how to sequence a basic hatha yoga class, an understanding of alignment and be able to proficiently explain it, properly apply hand on adjustments and comfortably take the seat of a teacher. Please do not apply if you have not completed a 200 hour training. Full payment is due access to the manual and membership website is given. A non-refundable deposit of $500 is required to hold your space in the program. The balance is due according to the tuition policy. We charge a $25 returned check fee. Refunds are available up to three weeks before the training begins minus a $400 handling fee. After this time NO refund or credit will be given if you decide not to attend. Should you cancel your spot, the $500 deposit cannot be applied to a future training. Once the training begins, if you decide not to continue for any reason, no refund or credit will be given. We welcome pregnant students! However, if your due date falls before the final exam or if your current work or life leaves little time for extracurricular activities, we strongly urge you to take the training later, when you have more time to devote to the coursework. Due to the nature of the Traveling Teacher Training, we cannot accommodate missed modules. Both weekend intensives need to be attended to complete the program. Prenatal Yoga Center is available for an 85 hour training, a weekend training, and pre/postnatal retreats. Please contact the studio for details.